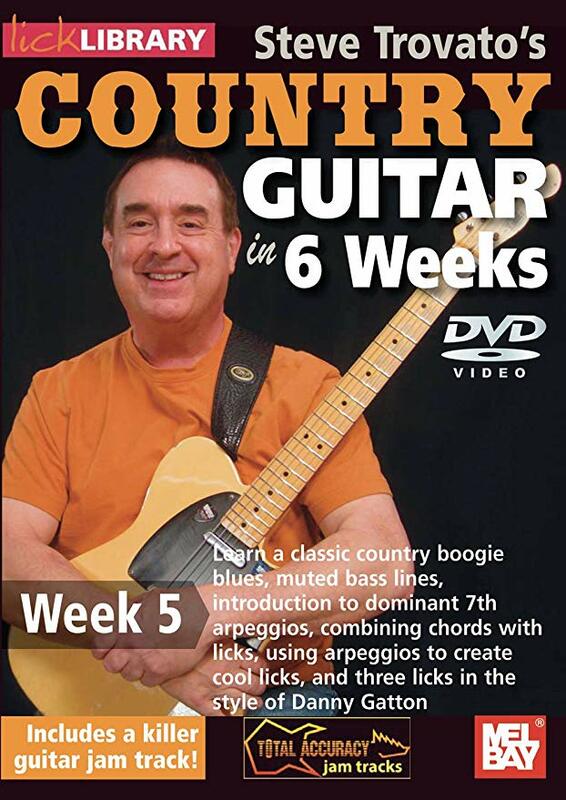 Welcome to the "Country Guitar in 6 Weeks" guitar course. This course is designed to focus your practice towards realistic goals achievable in six weeks! Each week provides you with guitar techniques, concepts and licks to help you play and understand country guitar soloing at a manageable easy to follow pace. With the "Country Guitar in 6 Weeks" guitar course the material is presented to you in easy to absorb sections which progress in a sensible, logical order. Country guitar virtuoso Steve Trovato explains and teaches everything in meticulous detail - you can't miss! Week one includes: The major pentatonic scale and variations in one position, correct right hand picking, country phrasing, sequencing the major pentatonic scale, and three important licks in the style of Vince Gill. Week two includes: The three octave horizontal pentatonic scale and variations in two keys, picking techniques, building solos using repetition, slides, hammer ons, pull offs and sequences, and three important licks in the style of Dickey Betts. Week three includes: Diatonic 6ths, playing major pentatonic scales across changing chords in a simple progression, pedal steel guitar licks and bending, chromatics, pick and finger technique, and three important licks in the style of The Eagles. Week four includes: Playing a classic country blues, chickin pickin techniques, one minor pentatonic scale pattern, mixing the major and minor pentatonic scale to produce bluesy country licks, and three important licks in the style of James Burton. Week five includes: Learn a classic country boogie blues, muted bass lines, introduction to dominant 7th arpeggios, combining chords and licks, using arpeggios to create cool licks, and three important licks in the style of Danny Gatton. Week six includes: Learn to play over a 4 chord progression, an introduction to major triad arpeggios, an introduction to hybrid picking, developing hybrid picking techniques, and three important licks in the style of Albert Lee.